Coming down upon the mountains of Zion; For there the Lord commanded the blessing—life forever. Often the poetic books in the Old Testament paint with emotions and poetry God's dealings with His people in their history. Whenever we enter into the short Psalm above, the author is reflecting upon the historical event of the beginnings of the Levitical Priesthood and the anointing of it's first High Priest - Aaron (see Leviticus 8-9). Why this event? It was a one-of-a-kind event. It was accompanied by sights and sound. The aroma of anointing oil being poured over Aaron and his sons signaled to the nation of Israel that God's appointed mediators between He and they were now in place. To certify Aaron and his son's as representatives of the people to God - God consumed the sacrifice on that first altar by the fire of His presence. Such a commemorative event is used to highlight the importance of uninterrupted fellowship among God's people. In the sight of God, when God's people are enjoying each other's company in His presence, His presence in turn will become more known to their awareness. God of course is everywhere, this we know. However, the senses of even a Christian person can be made dull by a combination of this world, the frailties of the flesh and the deceptions of Satan. To be part of a lively, Christian fellowship like the local church kindles the flame for God. The manner of the description of Aaron's anointing on that inaugural day of his ministry is placed in slow motion. We are directed to behold every detail, every drop of that sweet anointing oil. Why the attention to detail? To slow down the reader to pause, to meditate, to pray. Aaron and his sons were called to not only serve God and the people, but to tend to the fire of the altar, lit by God. That fire would feed the heat source necessary to make smoke in what was called "the altar of incense", located in the first room of the tabernacle. The priest would make his way into that place to light the lamps of the golden lamp stand, to eat of the food off the table of shew bread and to seek God in prayer at the altar of incense. As the Christian is called to Jesus Christ, the Eternal High Priest, such a calling includes the identity of being a spiritual priest in the things of God (1 Peter 2:9-12). Psalm 133:3 transitions from Israel's history to Israel's geography. The mountain chain extending from Mount Hermon (pictured below) to the North to Mount Zion to the South occupies the writer's thoughts. Mount Hermon is of special interest, since upon that mount the Lord Jesus Christ transfigured Himself before Peter, James and John (see Matthew 17:1-13; Mark 9:2-8; Luke 9:28-36). Just as God designed the breezes of that high range to influence the weather patterns of Jerusalem to bring rain in due season, Jesus' identity as God in human flesh, revealed on that Mountain, would influence and shape what would occur in Jerusalem. His death and resurrection was but proof of all He revealed atop of that mountain. 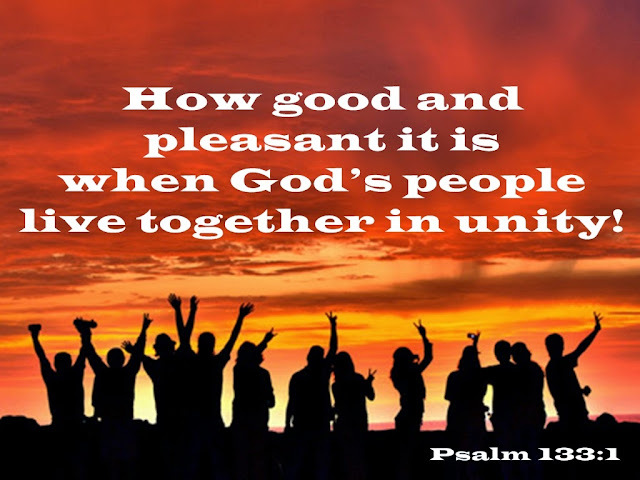 When God's people are dwelling together in unity, a wonderful atmosphere develops that brings increased awareness of God's power and presence. The Spirit's ministry in the Word, prayer and evangelism is reinforced. The scent of Christ's presence moves and shapes God's people and soon, all around note a difference between the church and the world (see 2 Corinthians 2:14-18).